If a disc gets stuck in your PS4, you can manually eject it. Turn off the PS4 system. Unplug the power, HDMI and any other cables from the rear of your PS4 system. Place the PS4 system on a clean, flat surface in front of you. Turn it over and rotate the system so that the PS Logo is facing away from you. Remove the cap from the screw hole directly above the PS Logo, as shown. Insert the screwdriver into the manual eject hole and turn anti-clockwise to release the disc. This may require serveral turns of the screw. There is a layer of plastic which you will need to push through to remove the screw. Don’t worry – this won’t affect the warranty. Reconnect the power, HDMI and any other cables that were disconnected in Step 1. Power on the PS4 system to make sure everything is functioning properly. Unplug the power, HDMI, and any other cables from the back of your PS4 system. On a clean, flat, surface place the PS4 upside-down, and look for the hole directly above the PS Logo. (as shown, notice the PS Logo is upside-down). Insert the screwdriver into the manual eject hole and turn to release the disc. There is a layer of plastic which you need to push through to remove the screw. Don’t worry – this won’t affect the warranty. Connect the HDMI, power, and any other cables that were disconnected in Step 1. Power on the PS4 to make sure everything is functioning properly. Insert the screwdriver into the manual eject hole and turn clockwise to release the disc. Turn off the PlayStation 4 system and disconnect it from the power supply. Disconnect all cables from the rear of the system. Place the system on a clean, flat surface in front of you, so that the front of the system is facing left. The PS logo on the top of the system should be the right way round. Place your palms on the system’s glossy panel and let your fingers rest on the far side of the system. Apply moderate, even pressure near the seam. Using your fingers as leverage, slide the glossy panel away from you. Shine a light through this vent to locate the manual eject screw. Slide the screwdriver into the vent and turn the screw anti-clockwise until the disc can be seen peeking out of the disc slot. This may require several turns of the screw. Very little effort is required to turn the screw. Grab the disc by hand and pull it out of the disc slot. Replace the glossy panel by positioning it over the exposed section of the system, a couple of centimetres away from the seam. Slide the panel towards the seam until it clicks into place. Reconnect all the cables and turn on the system to check everything is working properly. 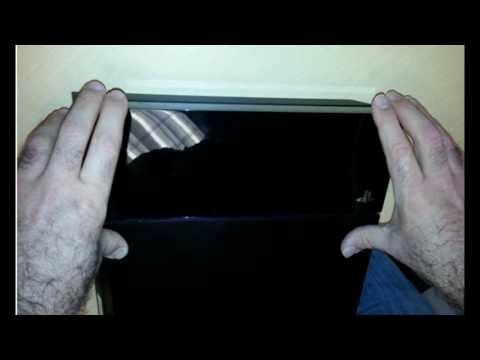 Video: "How to: Manually Eject Disc On PS4"